Dimensions 0.57 by 8.50 by 11 in. 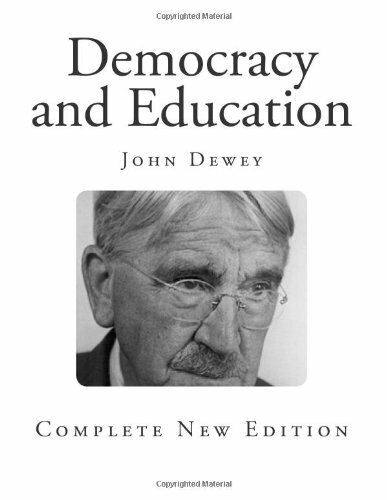 Amazon.com description: Product Description: Democracy and Education Complete New Edition By John Dewey The following pages embody an endeavor to detect and state the ideas implied in a democratic society and to apply these ideas to the problems of the enterprise of education. The discussion includes an indication of the constructive aims and methods of public education as seen from this point of view, and a critical estimate of the theories of knowing and moral development which were formulated in earlier social conditions, but which still operate, in societies nominally democratic, to hamper the adequate realization of the democratic ideal. As will appear from the book itself, the philosophy stated in this book connects the growth of democracy with the development of the experimental method in the sciences, evolutionary ideas in the biological sciences, and the industrial reorganization, and is concerned to point out the changes in subject matter and method of education indicated by these developments. Hearty acknowledgments are due to Dr. Goodsell of Teachers College for criticisms; to Professor Kilpatrick of the same institution for criticisms, and for suggestions regarding the order of topics, of which I have freely availed myself, and to Miss Elsie Ripley Clapp for many criticisms and suggestions. The two firstnamed have also been kind enough to read the proofsheets. I am also greatly indebted to a long line of students whose successive classes span more years than I care to enumerate.